As we have said before, the Information Technology industry is complex, constantly changing, and growing. The WAND Information Technology Taxonomy continues to grow and change as well and has undergone another update. We focused on three areas. In this revision, we drilled even deeper into IT Security and added terms to Security Threats, Attacks, Encryption and Intrusion Detection. We also expanded Technologies and Fields to include 3D Printing, Reality Technologies, Blockchain Technology, Smart Machines, and Digital Platforms. Then, we reviewed the current taxonomy to make sure we had the latest updates and versions of IT Certifications, Development Tools, Software Programs and Applications, and Languages. Updates were also made in the areas of IT Administration, Development, Computer Graphics and Web Design, Data, and Service Providers. 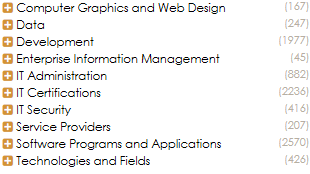 We also added Enterprise Information Management as a top-level term. This taxonomy now has 9,183 terms and 2,618 synonyms. The WAND Information Technology Taxonomy can be customized to include specific terms to meet the needs of any Information Technology Department. As with all WAND Taxonomies, the WAND Information Technology Taxonomy is available by itself or as part of the WAND Taxonomy Library Portal.